Go to Grandma's button box and choose a gorgeous old button that means something special to you. Or, use buttons found in any fabric store. I used a Mill Hill Treasure in the button space on these cute little babies, but there are many substitutes. Be creative! Change their hair and skin colors-it's easy to do-just look on some of my other designs or on the website for the colors to use. The sweet little bangs on their foreheads could be done in turkey stitch, if you wish. You can also purchase curls in a variety of hair colors in craft stores to couch onto the sides of the girl's face. Make yours different from any other! Add small bows made out of narrow ribbon. Archival glue is ideal for adding charms, gems, or other embellishments to the finished design. 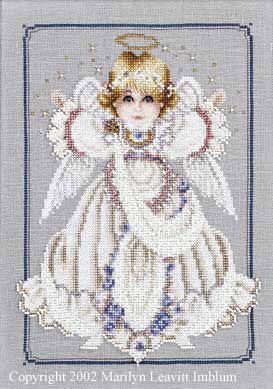 Stitch on a piece of real lace or use other dimensional stitches for borders. These "Button Box Babies" are quick and easy, and you can create them no matter what your skill level-just have fun with them! This design is stitched two-over-two on 28-count Smokey Pearl Cashel linen (No. 3281/778/55) from Zweigart. The picture shows the optional over-one face stitched over one thread on linen. The main chart has an over-two face for easier stitching. 14-count (28-count linen) 6.75" x 9.5"
16-count (32-count linen) 5.875" x 8.375"
18-count (36-count linen) 5.25" x 7.5"